We sell Clearspring products like Meridian Organic Sunflower Oil 500ml online in the UK and directly from our award-winning store in Scotland. Meridian Organic Sunflower Oil, with its golden yellow colour and distinct, nutty flavour, is a popular general-purpose oil. Meridian Organic Sunflower Oil, with its golden yellow colour and distinct, nutty flavour, is a popular general-purpose oil. It is a good source of vitamin E and rich in polyunsaturated fatty acids which, as part of a healthy diet and lifestyle, can help keep your heart healthy. Ideal for using in salads and dressings. The sunflower with its characteristic large turning flower head is a native American food plant that is also grown extensively as an oil and seed crop in Russia and Eastern Europe. Tinned green beans are seasonal as well. French beans are harvested in season and go straight into a tin for you to use later in the year. This recipe contains 1 tbsp sunflower oil. Jerusalem Artichokes are a real winter vegetable, don’t worry too much if you produce a lot of, er, ‘wind’ the next day, that’s completely normal because Jerusalem artichokes contain a fibre called inulin which ferments rather than digests, thus creating gas. Some good independent greengrocers will stock these knobbly roots, but if you can’t find them, you can always substitute with parsnips. This recipe contains 1 tbsp Sunflower oil. Another warming soup. Soups are great meals if you serve them with some (rye) bread spread with almond butter, butter, margarine or cheese. This recipe contains 2tbsp sunflower oil. A simple recipe with seasonal cabbage and noodles. Serve with fried banana for a sweet twist. This recipe contains 4 tbsp sunflower oil. Tasty way to use your (homemade) sauerkraut. Sauerkraut has lots of health benefits, besides that it's also virtually fat free. This recipe contains Sunflower oil. You can make it as spicy as you want by adding more or less chilli pepper to it. Serve this potato dish with pickled cucumber and (homemade) chutney. You can also add some (vegan) steaks or burgers. This recipe contains 1 tbsp sunflower oil. Cauliflower should be available from mid to late April. You can use dried or tinned chickpeas. Add extra time when using dried chickpeas. This recipe contains 1tbsp Sunflower Oil. If you use the products listed you can be certain they are vegan and gluten free (although might have been processed in a factory which also uses gluten and dairy). Other brands are available, but always read the label to make sure it doesn’t contain ‘hidden’ ingredients. This recipe contains 2tbsp Sunflower oil. Another simple, warming, winter recipe. Probably the easiest recipe I've ever written! This recipe contains Vegetable oil. Because savoy cabbage is in season throughout the winter months, this recipe is also seasonal if eaten in November, December or January. They originally should be shaped into balls, but they are also tasty when flat (as in my attempt!). This recipe contains 2 tbsp sunflower oil. Sauerkraut is fermented white cabbage as opposed to pickled and shouldn’t contain vinegar. It’s the lacto-fermentation which makes sauerkraut such a healthy vegetable. Sauerkraut is high in digestive enzymes, fat free, cholesterol free and high in vitamin C. It is also quite high in sodium, so should only be eaten in moderation by people with high blood pressure. You can reduce the sodium by rinsing the sauerkraut before cooking. This recipe contains 3tbsp oil. Dahl is an important part of Indian cuisine and often eaten with rice and vegetables. It’s a very healthy way of getting enough protein in your diet and red lentils also contain lots of fibre and vitamin B, essential for a proper nervous system. This recipe contains 2 tbsp vegetable or sunflower oil. A hearty winter dish with spelt, curly kale, carrots, eggs and veggie bacon. Spelt is an ancient grain eaten by our ancestors thousands of years ago. Some people with wheat intolerance can tolerate spelt, but beware; spelt still contains gluten! This recipe contains 3tbsp sunflower oil. Spring Onion & Cracked Black Pepper Creamy Pasta with Watercress, Spinach and Pine Nuts. Delicious vegan pasta! This recipe contains 2 tbsp sunflower oil. Who knew you can have your 'greens' and have cake at the same time?! This moist cake is a great way to avoid dairy and eggs or to surprise friends and family with. This recipe contains 125ml sunflower oil. Fun to make with children. Enjoyable to eat! This recipe contains 4 tbsp oil. A sweet and warming winter soup, although carrots are in season more or less year round! This recipe contains 1 tbsp sunflower oil. These tacos are filled with seasonal vegetables, like cabbage and carrots and they are vegan too! Cheap, easy and vegan. This recipe contains 1 tbsp sunflower oil. How can we reduce the pigeon population? By eating them! Pigeon breast is very high in iron and b-vitamins and low in cholesterol. It's also a very local and seasonal meat. Get it from your farmer's market, if you are not able to find it, you can substitute it with liver. This recipe contains 1 tbsp sunflower oil. Dairy free, egg free, lactose free and it still tastes of chocolate! This cake is a winner amongst friends and family. Serve with dairy free cream or just on its own. This recipe contains 100ml sunflower oil. This easy-to-make omelette uses eggs and smoked salmon. Go for salmon trimmings instead of sliced, because trimmings are a lot cheaper and you don't need to cut it either! This recipe contains 1tbsp (sunflower) oil. This seasonal recipe uses chard, but you can substitute it with spinach. Both should be available in September. Eggs are a perfect substitute to meat. This recipe contains 2 tbsp oil. Pumpkins store very well, so theoretically you can eat pumpkins from October until December, since they have been stored. This recipe contains 2 tbsp sunflower oil. A super simple, healthy vegan soup made with seasonal pumpkin and red lentils. This recipe contains 2 tbsp sunflower oil. In the Netherlands these blue podded peas are known as 'Kapucijners'. They grow very well in the UK and have beautiful blue pods. You can dry the peas for using in winter dishes, like this traditional Dutch recipe. This recipe contains 2 tbsp sunflower oil. Another Dutch 'stamppot' dish. Yes, we sure like our mashed potatoes! This is a vegan recipe but can be made vegetarian by using cheddar cheese, milk and butter. This recipe contains 2 tbsp sunflower oil. Simple, tasty, healthy, vegetarian and vegan January recipe. The vegetables in this dish are in season from October until March! This recipe contains 3 tbsp sunflower oil. British cauliflower is available almost all year round. There are varieties which you can plant in September and they will have heads early to mid spring. Peas are the same, I normally sow a few in March indoors in my unheated greenhouse and they are ready mid to late spring. This recipe contains 3 tbsp sunflower oil. This recipe is suitable for vegetarians and vegans. Sadly most shop bought piccalilli contains gluten, but you can make your own! Recipe soon to follow... This recipe contains 3 tbsp sunflower oil. This simple stir fry / salad is both seasonal, healthy and tasty. Serve with (gluten free) bread or noodles. This recipe contains 4 tbsp sunflower oil. Spicy vegetarian burgers with (homemade) piccalilli. This recipe contains 4 tbsp sunflower oil. Millet sausage are a great alternative to meat. Have them between a soft bun or on their own and serve with lots of salad. This recipe contains Sunflower Oil. These tasty pancakes are made with gluten free oat flour and Mheat streaky rashers. Suitable for a vegetarian diet. This recipe contains Sunflower oil to fry. Seasonal fact: because root vegetables store pretty well, you can still get British grown celeriac, turnips, carrots and onions in March. This recipe contains Sunflower oil to fry. As official Clearspring stockist, we sell genuine Cooking Oils directly from our shop in Scotland and online throughout the UK. Where can you buy real Organic Sunflower Oil safely online? If you are wondering where you can buy Meridian Organic Sunflower Oil 500ml safely online in the UK, then shop with us. We are an actual health foods shop; with real people selling real foods and products. Our award-winning independent shop is located in Stirling, Scotland since 1976. You can buy our Organic food and other genuine Cooking Oils in store or safely place an order with us online or over the phone. 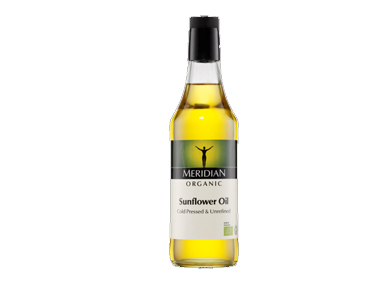 Organic Sunflower Oil - Meridian Organic Sunflower Oil 500ml in Cooking Oils and Cooking Oils & Vinegar.